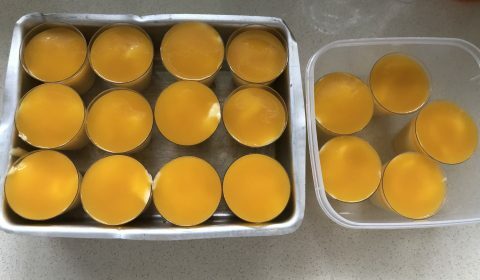 Eggless mango mousse is a creamy dessert made using fresh mango and cream. It is enjoyed by all and is a perfect dessert after having a good meal. 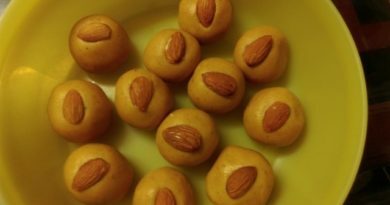 I have made this dessert during summer when fresh mangoes are available in plenty. I like using fresh mangoes for this dessert. However you can use the canned mango pulp available instead. 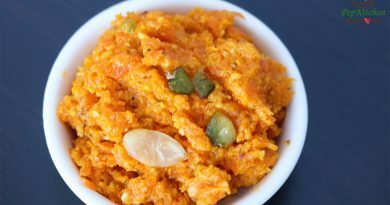 (If you are using canned mango use the alphonso canned pulp). 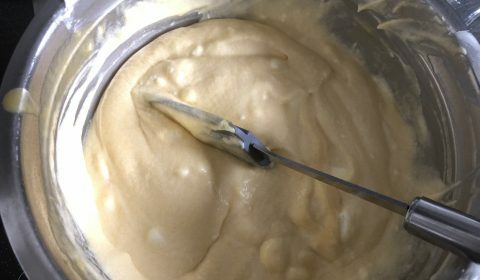 It will give nice taste and orange colour to the mousse. I have made this dessert when one of our good friends (Vinod, Ruchita and their son Ishaan) visited us. They were the first family whom we were introduced when we moved to Sydney. The couple is a very lovely, energetic and jovial couple. They have helped us lot and we love spending time with them. It was the Christmas holidays in Sydney. I have prepared some kebabs, bruschetta and kofta biryani for lunch. 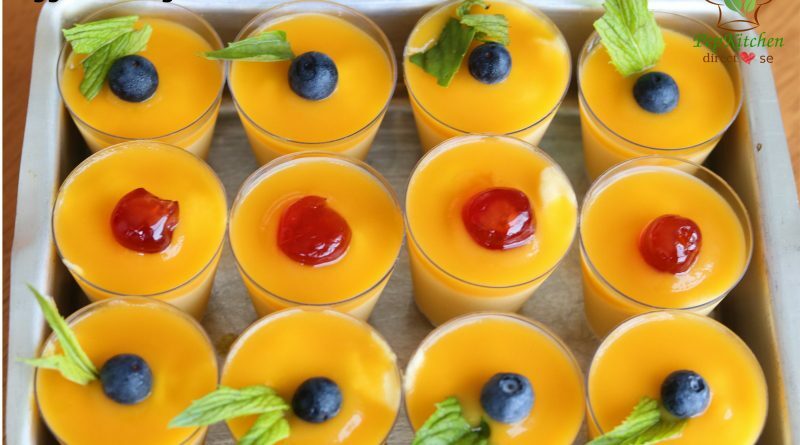 It was a hot summer afternoon and after having a good lunch, mango mousse was an excellent way to end our lunch on the hot day. They have enjoyed the food and the dessert. 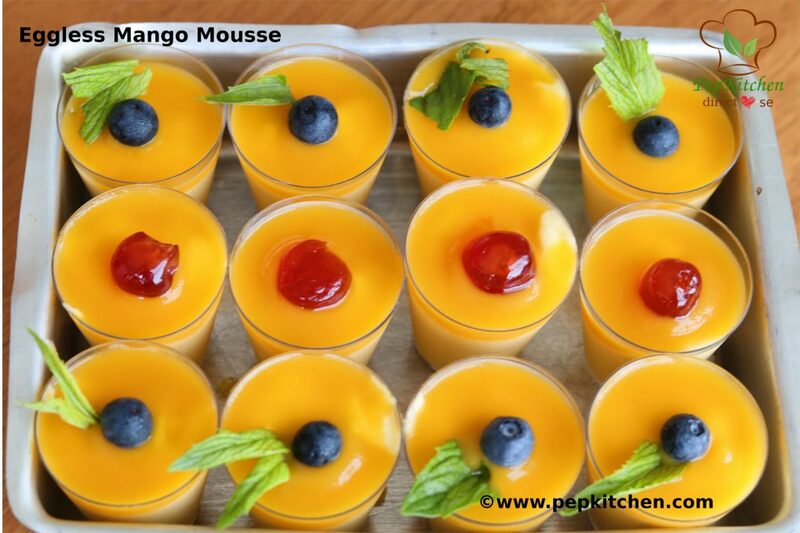 The colour of the mango mousse was eye catching and the taste the of fresh mango was divine. So friends just make this quick and easy no fuss dessert and enjoy it with your family and friends!! 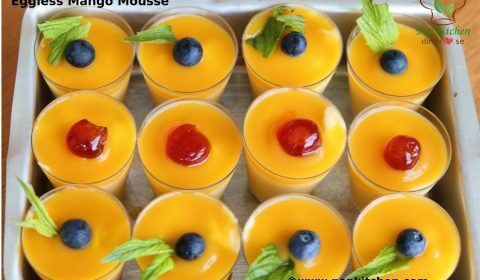 Eggless Mango Mousse is the creamy dessert made from fresh mango and cream. 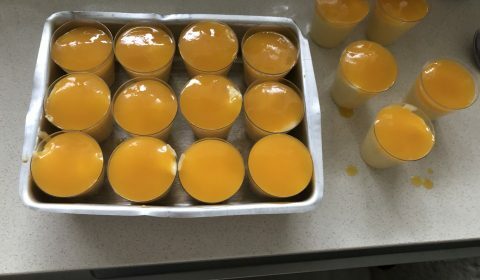 Agar-agar is used in place of gelatine to set the dessert. 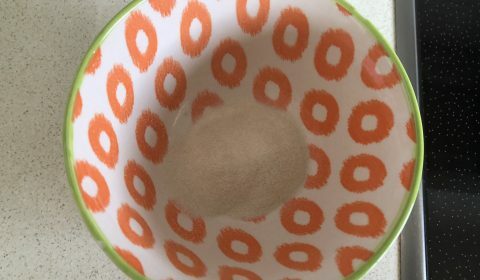 Take agar agar powder in a bowl. 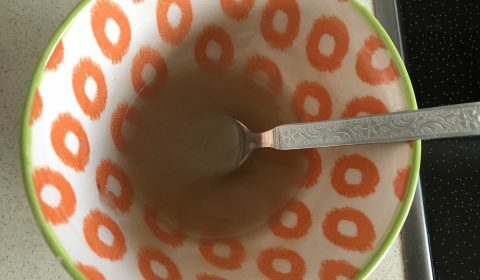 Add water to it and stir. The agar agar will be dissolved. Keep aside. 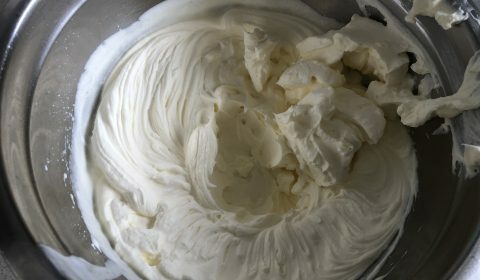 Take chilled full fat cream in a bowl. (I have put the bowl and the blades in the freezer couple of hour before whipping). 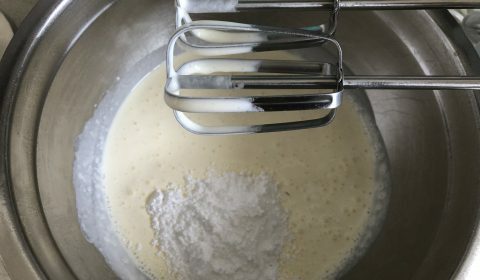 Start whipping with an electric beater on low speed for 4 minutes. The cream will start to become thick. Add the icing sugar to it around 1/4 cup. Beat on medium speed for 4 minutes. Soft peaks will start to form. Now beat on high speed for another 4-5 minutes. Now take mango pulp in a pan. Add 1/4 cup of sugar and melted agar agar. Mix well. Let the mixture come to boil and everything is dissolved well. Remove from heat. 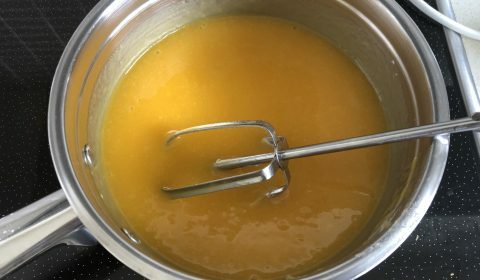 Add lemon juice and let the mango mixture cool. 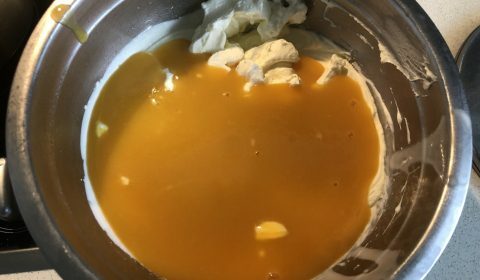 Now take the whip cream and add mango mixture to it. 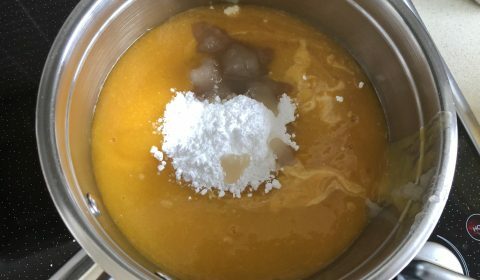 (leave 1/2 cup of mango mixture aside to be used as a glaze). 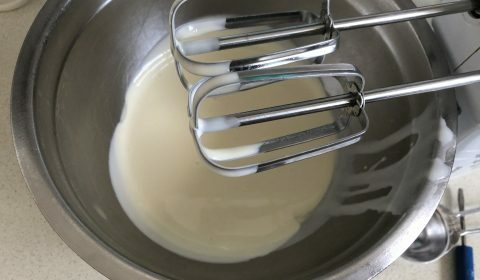 Gently fold the mixture till everything is mixed well. 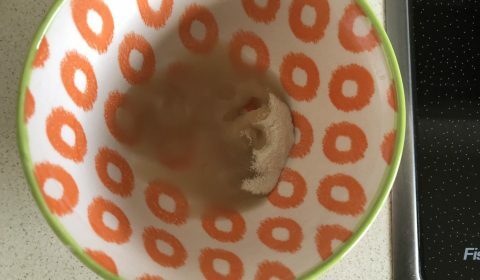 Take the container or glasses in which the mousse is to be set. 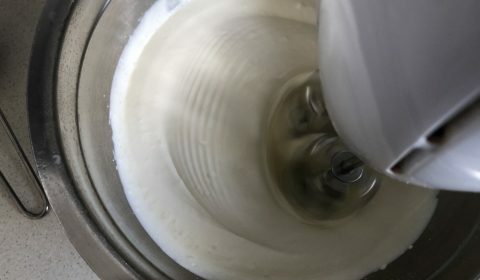 Fill first with the prepared cream and mango mixture. Now top with the prepared mango mixture glaze. Set in the freeze for 5-6 hours. 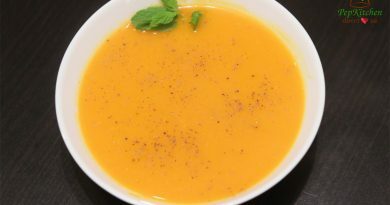 Remove from the refrigerator and garnish with cherry or blueberries or mint leaves or mango cube or dry nuts. 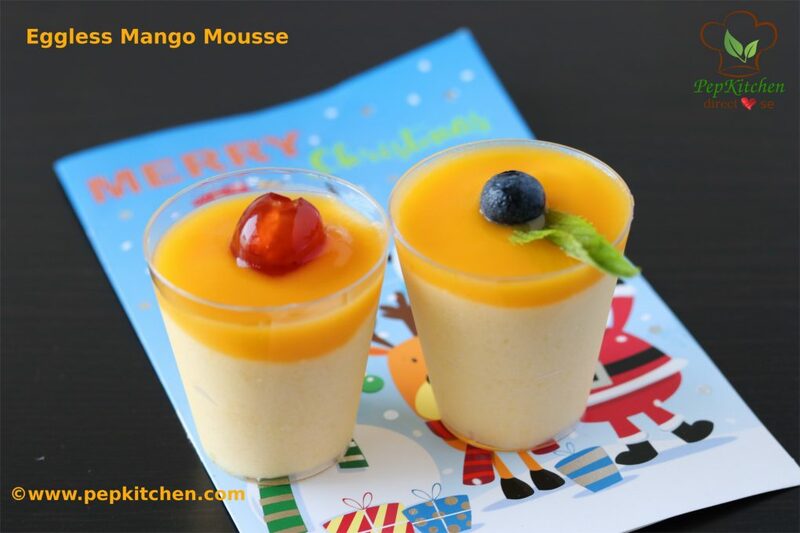 Serve the mango mouse chilled. very delicious and tempting dessert. Lovely colours. Very tempting recipe good for summer desert….